United Airlines has opened new lounges at Atlanta Hartsfield-Jackson International and San Francisco International airports. 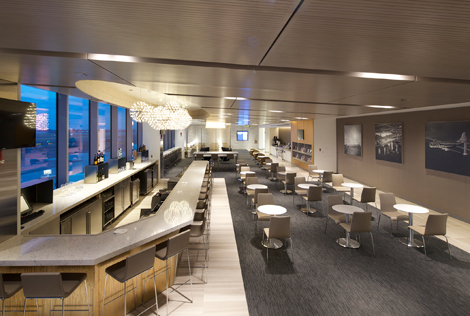 This will also see United renovate and update other lounges at New York Newark, Chicago O’Hare, Los Angeles, Fort Lauderdale, Dallas-Fort Worth and Guam airports in 2016. The nearly 460 sqm Atlanta United Club has a capacity for more than 100 people and is located between gates 11 and 12 at Concourse T on the mezzanine level. The latest United Club is 550 sqm in size and is located in the newly renovated Terminal 3 East Concourse, which also recently reopened. It can seat 130 guests. It joins two other United lounges at the airport – in Terminal 3’s Concourse F (see news, June 2014) and in the airport’s International Terminal G.
Jimmy Samartzis, United’s vice president of food services and United Clubs, said: “Our customers deserve the very best travel experience, and our new clubs are not only beautiful spaces, they are also very functional and will provide the perfect settings for customers to relax, refresh and recharge before their flights.